(2 Crates 295lbs each)Actual weight 450 Lbs. Full function testing of the rapid shut down. NOTE: the Birdhouse, Combiners and Cat-5 cable are sold separately. (2 Crates 310lbs each)Actual weight 450 Lbs. Classic 150 will include mounting bracket, SPD300 DC, 2 DC breakers and Wiring. Classic 200 and high voltage input breakers will include mounting bracket, SPD300 DC, 2 DC breakers and Wiring. Classic 250 and high voltage input breakers will include mounting bracket, SPD300 DC, 2 DC breakers and Wiring. Two Classic 150s will include mounting bracket, SPD300 DC, 2 DC breakers and Wiring. Two Classic 200s and high voltage input breakers will include mounting bracket, SPD300 DC, 2 DC breakers and Wiring. Two Classic 250s and high voltage input breakers will include mounting bracket, SPD300 DC, 2 DC breakers and Wiring. All MidNite components have a 5 year warranty. 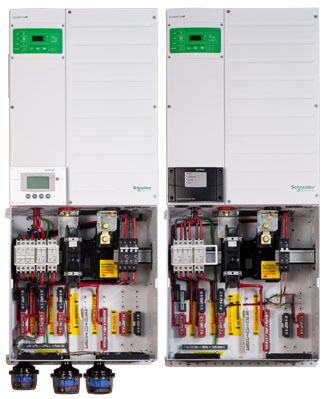 Schneider Inverters and components are covered by Schneider's manufacturers warranty. Our pre wired e-panels can be ordered with any of the common battery based inverters (except Outback). Please contact us for a quote if the Inverter model you need is not listed. NOTE: MidNite does not warranty Schneider components. Description: Schneider Conext XW+ 6848 120/240 vac Inverter. Rain tight aluminum battery enclosure with locking door and two shelves. MNBE-D holds 8 PVX3050T or 8 golf cart or 8 group 31 batteries. Our Best Value! Battery Enclosure with locking door and two shelves. MNBE-D holds 8 GVX3050T or 8 golf cart or 8 group 31 batteries. With the optional third shelf, the MNBE-D holds 12 group 31 batteries. Battery Enclosure with locking door and one shelf. Holds four 8D batteries.